On arrival, our driver welcomes you at the airport, transfer to hotel. Check in. Afternoon tour of Saigon including Reunification Palace, Notre Dame Cathedral and the Old Post office, War Remants Museum, Giac Lam Pagoda, China Town with ancient pagodas and temples and bustling Binh Tay Market. Back to Hotel. 8.30, drive to Cao Dai Temple in Tay Ninh to observe the midday service. Cao Daism is a combination of Buddhism, Taosim, Confucianism and Christinaity. After lunch, we drive to Cu Chi Tunnels – the famous base during US – Vietnam war. Back to hotel. + 8.00, driver pick you up at hotel, Transfer to Cai Be. The crew welcomes you on board in Cai Be. Enjoying an interesting Cruise on to visit Cai Be floating market and stop by to visit many of local factories, fruit markets and plantations on the bank. Your sampan will take you to Vinh Long and Sa Dec, cruise upstream Tien Giang River. + Disembark to take a small rowing boat for a cruise along and narrow canel pasasing by a local tiny village and fruite plantations. Get off the small boat to visit Sa Dec Town with beautiful French Old Houses and Chinese Temples. At around 6am, your sampan will slowly start cruising. Breakfast will be served on board at 07am while approaching Cai Rang floating market actually still the largest in the whole Mekong delta. There are 2 options for beaches that you can choose. 5 hour drive from Saigon. 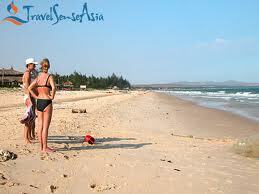 A hub of beach resorts with 18km white sand beach. A good combination of water sports with some Sand Dunes, fishing village or waterfall visit. A crystal clear water beach, the island is famous of making fish sauce now becoming another spot for tourism and has been developed real fast in the last few years. Fresh seafood, high quality accommodation by the beach. A very good choice for families vacation and honeymooners. You can either reach to Phu Quoc island after Mekong Delta by Hydrofoil or fly directly from Saigon. Transfer back to Saigon from Beach you choosed, connect with your departure flight. Vietnam Visa stamping fee (25USD for Single entry and 50 USD for Multi Entry at the airport).